This release came out on Record Store Day 2013. 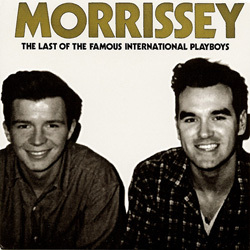 For information on the original 1989 edition of "The Last Of The Famous International Playboys", see here. 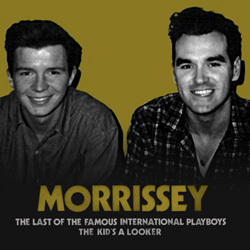 The cd-single and digital artwork show a photo of Morrissey with Rick Astley taken backstage at Top Of The Pops in 1989. 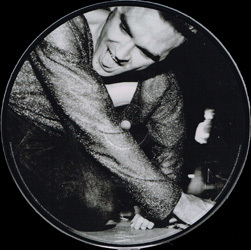 The sleeve was originally going to feature a previously unseen private photograph of David Bowie and Morrissey taken by Linder Sterling in New York in 1992. Although Bowie has no legal rights to the photograph, most of his back catalogue was at the time licensed to EMI so he successfully managed to order EMI UK not to run the proposed artwork. 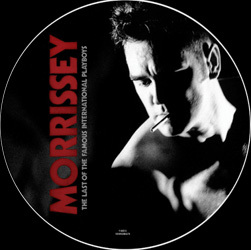 UK: The release was promoted with the help of a 4-track cd-r dispatched with an insert inside a clear plastic sleeve. This promo is actually the only compact disc source for the material from this single's vinyl and digital editions. 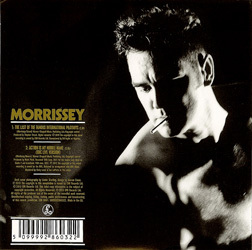 The insert has release identification in black and a red EMI logo on its front and the track listing, a red EMI logo, copyright and promo warning on its back. The disc is white with black text and logo.